The Hornets don't have much to work with in salary cap space, so they must look to the NBA draft to improve. While the NBA playoffs are still going, the 2017 off–season is rapidly approaching for many teams with massive decisions to make. CBA expert Danny Leroux breaks down the major challenges and opportunities for the Charlotte Hornets in The Crossover's NBA Summer Preview series. Like so many teams, the Charlotte Hornets spent assertively last summer. They were coming off a playoff appearance and opened the coffers to retain Nicolas Batum and Marvin Williams while also giving center Cody Zeller a reasonable extension. After a disappointing 36–46 season, the Hornets now have to figure out how to improve their roster without any salary cap flexibility, made even more challenging by their horrendous acquisition of Miles Plumlee at the trade deadline. GM Rich Cho also has to navigate the luxury tax because it appears unlikely that Michael Jordan would be willing to foot that bill for a non-elite team. Those challenges give Charlotte a fascinating summer with some intriguing possibilities and potential pitfalls. 11th overall pick: Charlotte’s best chance to add a key piece will come in the draft. They should not expect a late lottery pick to become an immediate contributor but having an eventual rotation player and hopefully a starter on a team-friendly contract would make it much easier to navigate the next few seasons. It is too early to speculate on potential picks at the spot but it looks like the Hornets will have options at various positions and niches in a pretty deep draft. After all, just two years ago Indiana picked Myles Turner at that spot and he looks to be a long-term starter at center. Ramon Sessions: The Hornets have a team option for Sessions worth $6.3 million and that number could be significant because of the luxury tax. The Hornets will function as an over the cap team but can still stay below the luxury tax line, which would also open up both the larger Non-Taxpayer Mid-Level exception ($8.4 million vs $5.2 million) and the Bi-Annual exception ($3.3 million). Using both of those team-building tools while retaining Sessions would be incredibly difficult unless they are willing to start the season over the tax line and eventually drop below it during the season. To make matters more complicated, letting the veteran go creates a clear need at backup point guard that would necessitate the use of the MLE or BAE. Even so, moving on is their best option. Shooting guard logjam: Last summer, Charlotte used a portion of their salary cap space to acquire Marco Belinelli and 2015 acquisition Jeremy Lamb’s three-year, $21 million extension kicked in as well. Neither started as coach Steve Clifford used Batum in that role and Lamb played just 18.4 minutes per game. If the Hornets want to keep Sessions but still use the Non-Taxpayer MLE and BAE, they could try to find a team interested in either Belinelli or Lamb to clear a similar amount of money. 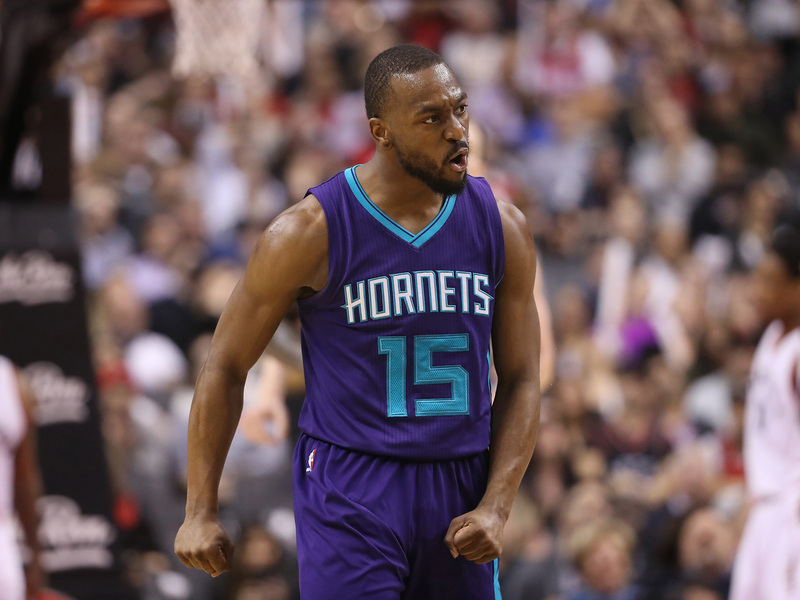 Potential Targets: If they let Sessions go, the Hornets’ biggest need is at backup point guard. An ideal fit would be able to run the second unit and play with Kemba Walker like Jeremy Lin did during the 2015–16 season. Deron Williams would be intriguing and they could also try to give restricted free agent Ron Baker an offer sheet. Charlotte should also consider retaining Brianté Weber as a third point guard who could become more than that, particularly at a minimum salary. A shooter like Bojan Bodganovic, Omri Casspi or Brandon Rush could also give the team a different look that fits well with Michael Kidd-Gilchrist’s strengths and weaknesses. Pressure Scale: 3. Their die is already cast with the significant expenditures last summer and ill-fated decision to take on Plumlee’s exorbitant contract. Other than making sure they take the best player available with the 11th pick, the front office will have a narrow field and needs to make the most of it. Compared to other teams, that is a walk in the park. State of the Franchise: Maintaining. While the Hornets are pretty constrained in terms of adding new talent, something working in their favor is that they are not a particularly old team. Only Marvin Williams and Belinelli will be in their thirties and improvement from Zeller, Kidd-Gilchrist, Frank Kaminsky and/or Lamb would substantially brighten the franchise’s future. A hit on their first round pick would as well and approaching the draft with a “best-player available” mindset makes that more likely since they incorporate a contributor just about everywhere. The more lucrative Mid-Level exception in the new Collective Bargaining Agreement also works in Charlotte’s favor and they could be able to find a value or two on a much more tepid market than last summer. While circumstances could change, it also looks like the Eastern Conference playoff picture will be more forgiving than the West, opening up a larger berth for them. It will take health and good fortune but a successful off-season could play a major part in making the Hornets a reliable playoff team for the next few seasons.